In early 2015, Ninestiles Academy Trust and The Sixth Form College Solihull began discussing the possibility of a merger between the Trust and College. A Government review of Further Education provision for Birmingham and Solihull later recommended the College converts to a 16 to 19 academy and joins Ninestiles Academy Trust. The Boards of both the College and Trust voted in December 2016 in favour of pursuing the conversion and merger and submitted formal applications to the Department for Education. The Department for Education accepted the application meaning, the Sixth Form College Solihull was the first college in the country to join a multi- academy trust – making this a pioneering merger. 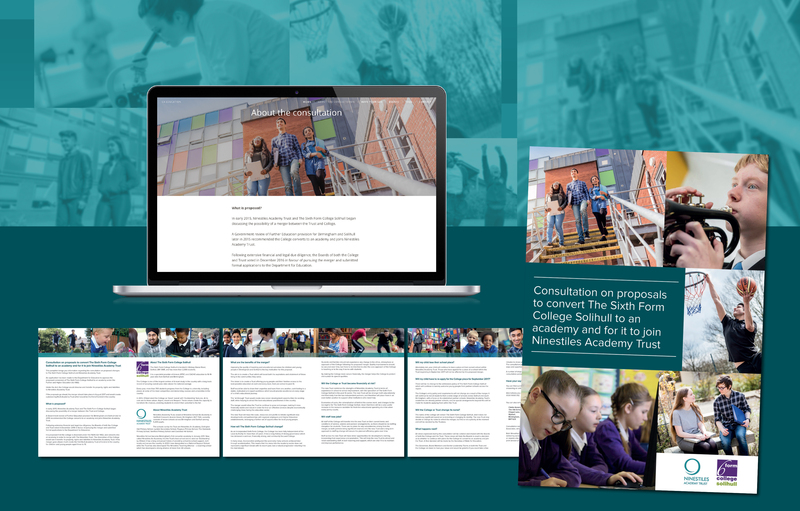 In 2016 we were approached by Ninestiles Academy Trust to carry out the consultation process regarding its plans to expand and take over The Sixth Form College Solihull. Through the drop-in sessions and the survey we allowed parents, students, staff and stakeholders the opportunity to voice any concerns about the merger – something which may otherwise have reared on social media. The press releases concerning the merger were received positively and the Trust gained substantial coverage in the local media.